Make a list of all the things you've paid for and what is left to be paid and when. Prioritise the money you have available for things that need to be paid urgently and set aside as much as you can for anything else. Just being aware of what needs to go out and when can make us feel better, even if the amount of money is terrifying. It's all about being proactive. Reassess your budget. Maybe there are things you budgeted for and have changed your mind about? If they're not deal-breakers, take them off and allocate the budget you had for them to something you really want. Make a list of your must-haves. It's easy to get caught up in all the little details (thanks Pinterest!) but do they matter to you? Again, if they're not make or break for you, invest the money somewhere else. Ask for help. Turn to your family for support. They may not be able to offer financial help but they will certainly pull together to help support you to find an alternative if you need to. Just talking about money worries will help you to put them in perspective and make them feel more manageable. Make a "To Do" list. Write down all the tasks that need to be done along with deadlines. Delegate what you can to your partner (it's his day too remember! ), friends and family. If something on the list keeps getting put back, consider whether it's really necessary or not. 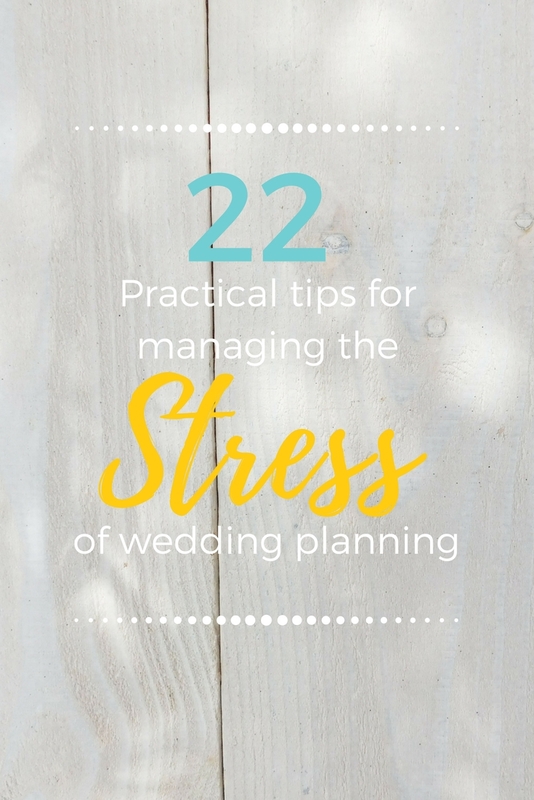 Set aside some wedding planning time each day and keep it to a strict timescale - an hour or two at most. Get your partner involved - it's much more fun working on your wedding together! Having a time limit will help you to stay focused and make you more efficient. Take a break. Yes, I know. I learnt this the hard way when I was teaching. The thing is, our brains struggle to think logically when we're overtired, overwhelmed and stressed. The best thing to do? Get outside and get some fresh air. Go for a walk or play with your pet. Go out for some dinner or a coffee together. Or treat yourself to a bit of pampering, even if it's just putting a facemask on at home and painting your nails. I can guarantee that once you start to relax, you'll get a clearer idea of what needs to be done and regain your focus. Follow your heart. Go with what you really want - it's easier than having regrets later on and if it's down to money, reassess your budget and see what you can sacrifice instead. Be kind to yourself. You're doing the best you can so give yourself a pat on the back. This will pass. Talk to your partner and share your worries. It really does make a big difference and getting it out in the open will start to make things seem more manageable. Avoid wedding-related things for the day. Or weekend. Or week...like I said before, give yourself a break and, once you're feeling more relaxed, you'll be able to get some more perspective. Write down all the reasons you can't wait to spend the rest of your life with your partner. This will remind you of what it's all for (because it's easy for us to forget sometimes) and shift your mind set from being all about what the wedding looks like to celebrating the start of the next chapter of your journey together. Call in a wedding planner. If wedding planning is getting too much, take a look at your budget and see if you can enlist the help of a wedding planner. It may seem like a big expense at first but when you factor in all the jobs they can take off your shoulders, plus potentially get you better deals on things, it may well be worth it. Just make sure that you choose someone that suits your style and that you feel you can work with. Get the calendar out and make a list of all the tasks that need doing. Allocate certain tasks to each day and make sure to prioritise the most important things. Get your family and friends involved. Give everyone a little task to do to help out. This also helps people to feel included and can make your day feel that little bit more special. Email invitations rather than send formal ones. If you need to get everyone together quickly, why not forego the traditional wedding invitations and send out a nice email instead with the key details. You can create beautiful resources for free on Canva, and there are loads of templates if you're not feeling overly creative but want it to look pretty. It also means that your guests can reply straight back so you know exactly who is and isn't coming. Keep in mind that not everything will go to plan. Things happen because that's life, but the suppliers you work with will ensure that all the bits they're working on get done on time and will not let you down. In reality, you probably won't even notice if someone's buttonhole fell off or if someone didn't like the food. Your only mission on your wedding day is to enjoy every minute of spending time with your new husband or wife. That's what you'll remember in years to come. It will all be ok. Things will come together and you will have an amazing wedding day. Don't be afraid to ask for help and to say that you're finding something difficult - worries just grow when they stay in our heads! All you need to remember is this: stay true to yourselves, support each other and you can't possibly go wrong.